Clout or Klout? A Primer On Why They Are Different. This spelling can be used to indicate a person’s or a brand’s clout online when referring to the social media influence in a wholistic sense, but not when discussing the actual rating of their influence. That’s a Klout score. A Klout score is determined by a person’s online clout. The term “Klout” is a brand, not a noun. It comes from the website and mobile app Klout.com, which uses social media analytics to rate users according to their online social influence. Think of it as a scorecard for social media folks – the higher the number, the stronger the perceived impact online. Social media influence is determined by analytical factors like the number of followers and friends. Klout calls them signals. However, it’s the other deeper indicators that can make the number jump. Mentions on Wikipedia, Bing, retweets, likes, and comments capture the true reach of an account. 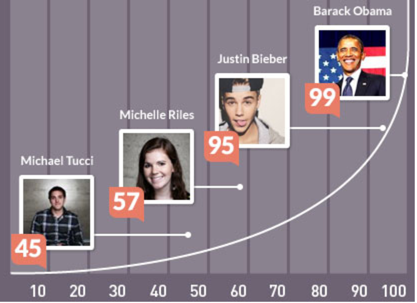 To put it all into perspective, President Barack Obama has a Klout score of 99. Justin Beiber’s is 92. The hoi polloi will get an average Klout score hovering somewhere in the 20s with one or two connected social media accounts. How to determine your Klout score? Sign into the website and add your social accounts – and presto – you have your Klout score.